The graphic artists at Signs Express can recreate your logo or create a completely new logo for you. Artwork varies in cost according to the type of design and is quoted on a case-by-case basis. For a quote on re-creating your logo, email your file to info@signsexpresstexas.com. You can also contact us directly by calling 512-443-SIGN (7446). Acceptable digital print file types include high-resolution .PSD, .AI, .EPS, and .PDF formats. Please note that most web images are unacceptable for high-resolution prints. Logos or images taken from a website look great on screen, but won’t work for large-format printing. Vector files such as adobe illustrator can scale to any size with no loss of quality. Vector or line-art file types that may NOT incur any additional artwork setup fees include .AI, .EPS, and .PDF. However, saving a .JPEG, .BMP, etc. as one of these file types may require an additonal art charge to vectorize. 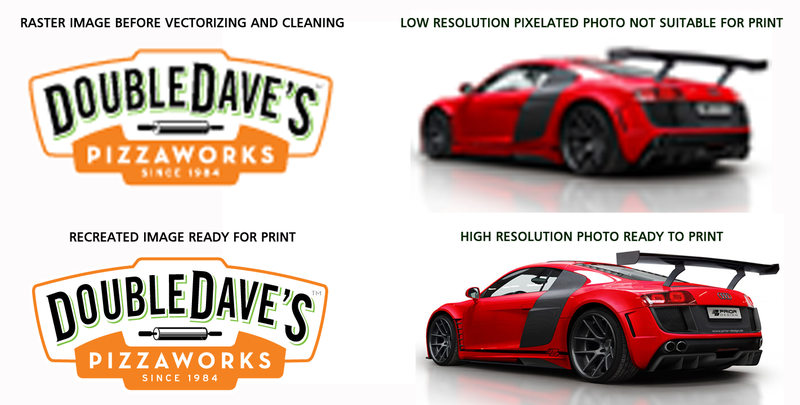 The Double Daves images below represent a raster image that has been vectorized, cleaned up, and ready to print. If you are unsure as to whether or not your logo is saved as an acceptable file type, please consult one of our designers.